Recently Facebook introduced the new redesigned profile page called Timeline to all Facebook users.The new Facebook Timeline feature is a great way to look back to see what you’ve shared. But we want to show the full potential Timeline has, by adding the future. It’s the beginning of the year. A time when most people self-reflect and look back on what they’ve experienced and achieved. Schweppes believes it is also a time to look forward, to bigger and better things to come. We say, celebrate the unknown and aim for the moon. But then again, who knows what 2012 will bring? Well, have no fear: in true Schweppes spirit, we will give you a preview of that Unexpected Future. The Unexpected Future app will take the Facebook user on a trip through their unexpected future. Showing them a worldly and successful 2012, in themes such as romance, career and more..
Schweppes can proudly say it is the oldest soft drink in the world, dating back to 1783. It stands for refined flavours, premium quality and stylishness, offering the most refreshing experience in over 90 countries around the world. Besides being a premium adult soft drink, it is also the reference in terms of cocktails and your best mixer companion at night. 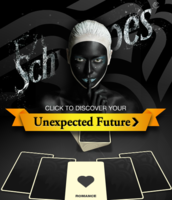 Schweppes teamed up with digital agency Red Urban, who are responsible for the concept and development of the Unexpected Future app and social media agency Super Social who are responsible for seeding.